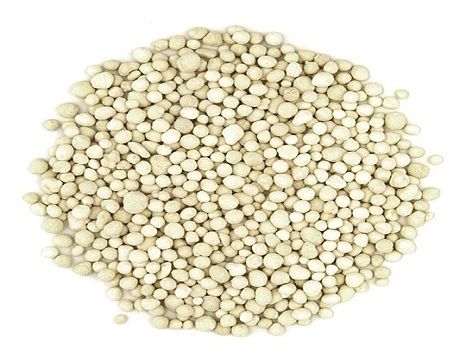 Mono ammonium phosphate (MAP or ammophos) is a complex, highly concentrated, ballastless, water-soluble mineral fertilizer. It is not hygroscopic and has a granular form with equal in size granules because of which it is dissipated evenly along the soil surface. It contains two main nutrients in its composition — 11% nitrogen (N) and 52% phosphoric pentoxide (P2O5) or in total 63% of active substance, which makes it easily absorbed by the plants. Ammophos is with the highest percentage of water-soluble P2O5 (min. 52%) amongst phosphorus fertilizers. The availability of phosphorous ions creates conditions for more energetic absorption of ammonium nitrogen. Phosphorus deficiency reflects negatively over the blossom formation, the seeds and the fruits which results in lower yields. Mono ammonium phosphate is appropriate for fertilization of all soils and crops. Because of the fact that it is water-soluble, it has the properties of fast-acting phosphorus fertilizer, and the low mobility of the phosphorus in the soil allows its use for main, stocking as well as for periodic fertilization. This fertilizer is input with the main treatment of the soil or prior to sowing. It is also used in main and pre-sowing fertilization of all field vegetables, fruit crops, grape vines, herbs and flowers. It is stored in covered, cold and dry storehouse premises. Heating and mixing with water is not desirable. It is transported packaged or in bulk. Agropolychim AD offers mono ammonium phosphate in packages of polythene and polypropylene, in bags of 50 kg and 500 kg. ОTotal contents of nitrogen 11 % min. Contents of Р2О5 52 % min. Granules from 1 to 5 mm 98 % min. Granules under 1 mm 2 % max. pH in 10% water solution 4,5 % min.